Welcome to Craf-Tay Corner, the monthly feature showcasing the creative side of our Talk Amongst Yourselves members. Every month I talk about projects from around the community as well as my own and give everyone a chance to show off how awesome and talented they are. Additionally, Stormborn showed off more of his amazing Pokemon redesigns and a few strips of his new comic, GiantBoyDetective's wife provided TAY Open Forum with some lovely banners and the official TAy Mascots from Invading Duck got their finalized colors. But now it's November, that weird awkward position where it's just a little too early to start Christmas projects (unless you're some kind of Stepford freak of nature that got their families presents in June or something.) and most of the major cons are over for the year. But like I imagine many of you, you probably have at least a few unfinished projects that have been haunting you for several months that you've been putting off in favor of more important and timely stuff. Since this might be your last opportunity before the craziness of the holidays and the year ends, I declare this 'Finish Outstanding Projects November'. I have way more than these unfinished, but these three projects are the ones I am most adamant about finishing. Completion Level: About 90%, give or take. 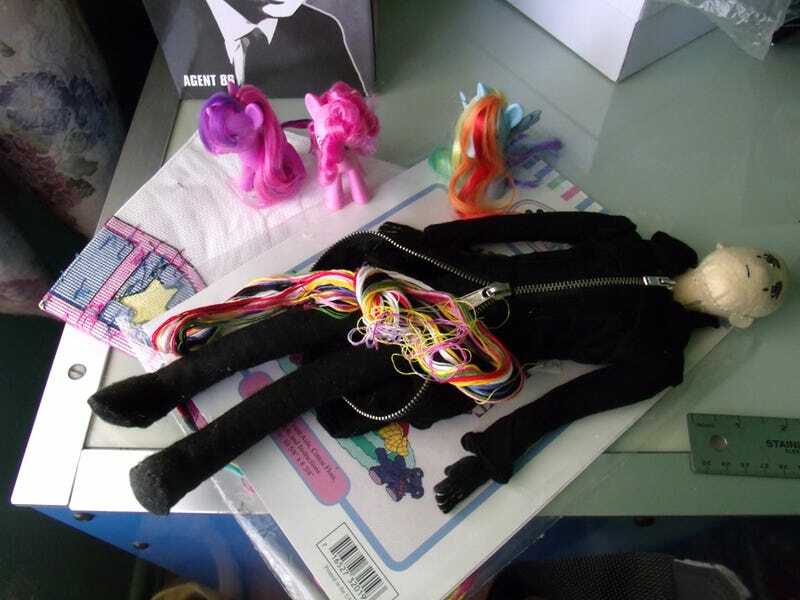 Oh my god this poor doll has been unfinished for so long I don't even remember what exact year I made it. A big reason for the delay was I had a hard time finding the right kind of zipper for his coat. This is supposed to be Axel from Kingdom Hearts, and as you can see, there isn't much left to do. I just need to give him some hair (which I have) as well as the beads for the straps at the end of his hoodie (which I also have). It's really not much left to do, I could probably finish it in a few hours, but I keep stalling. Years Outstanding: About 6 months. Earlier this year my friend Molly had her first baby, and I was making this in anticipation of the birth. I actually got the picture done before the kid was born, and waited until I knew his birthday to put his name, and the date of his birth. He was born in March, and yet I still haven't finished it. I had all sorts of con stuff to do, which was why this one got put off, but I want to get this done soon, as babies have that annoying habit of growing up really fast. I'm hoping to get this sent out before Christmas since the kid is still very babyish. I like My Little Pony, and I also like taking the brushables and making them show accurate by tweaking their hair, cutie marks and giving them their missing accessories. I've had these guys for about 2 years now. I've finished 3 of them, but these guys are still outstanding. I actually have a bunch of brushables still in their packaging because I don't want to open them until these guys are finished. I'll be getting even more for Christmas since I like to take advantage of the toy sales, so I want to get these guys out of the way. So what projects are you guys working on and want to finish? Use the comments to post pictures and talk about projects you're doing, have finished or plan to start. If you post a thread, don't forget to tag it 'Craf-TAY Corner' so it can be featured next month.